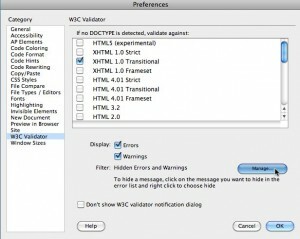 If you have any errors, they will appear in the W3C Validation panel. Simply double click each error to be taken directly to the culprit in Code View. You can also choose to save the report if you’re into that sort of thing. But very often during development, the list of errors can be quite extensive – and even irrelevant. For example, I don’t bother to put alt text (or even an empty alt attribute) on placeholder images that aren’t actually going to be used in the final page. For that reason, Dreamweaver also allows you to suppress errors from a report. Right click on the desired error and choose Hide Error to add it to your list of suppressed errors. Of course, you’ll want to make sure you’ve actually fixed those errors before going live. 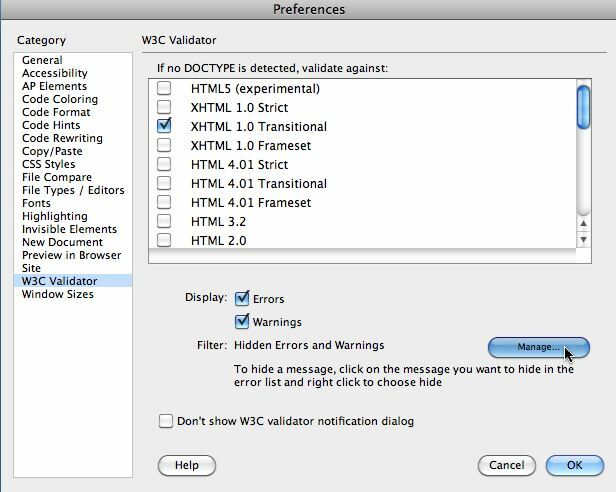 Therefore, Dreamweaver CS5.5 allows you to remove errors from the list of Hidden Errors by choosing Settings from the W3C Validator button and clicking the Manage button. I love this idea to be able to add to my workflow, now I just have to do it. It’s nice from Adobe to integrate the W3C validation, but I don’t understand why Adobe’s Dreamweaver let me make so many errors. * Horizontal line elements are obsolete. * Horizontal space between images(hspace=”2″)is obsolete. And so on. Advice of W3C: use instead CSS! Also why to supply so many obsolete instruments in DW who further on will be blamed?